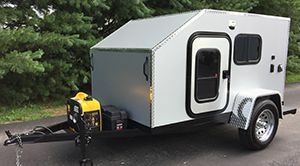 With over 38 years in the industry, PeeWee Campers has brought all its experience to bear on the new shape of teardrop campers for the 21st century. We've set the standard for a new world of teardrop shapes that give you more room inside and offer more functionality. 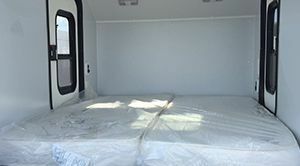 Small: 5' x 10', 6'-4" interior height - the "Big Brother" - you can stand up in this one. Sleeps 2. Tiny: 4' x 6', 44" interior height - the "Small Fry" - small enough for trikes and motorcycles to pull, but also great for fishermen, hunters, and outdoor enthusiasts. Sleeps 1. Your car is too small to pull a camper? You can't afford the fuel it takes to tow a heavy trailer around. You won't be able to maneuver the camper in “tight” places or in congested, city traffic? You won't be able to tow a camper into those truly out of the way places? If you answered “yes” to any of the questions above, then the PeeWee teardrop campers are just what you need! Our teardrop campers are perfect for camping at campgrounds or boondocking, tailgating at sporting events and races, hunting, fishing, and just enjoying the outdoors on your own terms. If you are looking for a teardrop camper for sale, look no further! Through a trusted Federal Reserve bank. Make application by phone or online. Get an answer in 24 hours or less. 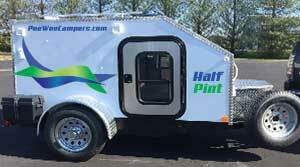 See features and options of our flagship small teardrop trailer, the Half Pint. Tour the KnockAbout and the Small Fry. Click the Videos button below. Our 5x8 teardrop campers are perfect for one or two people. The wall-to-wall mattresses make a queen-size bed. Aerodynamic design and lightweight construction is easy on gas mileage. Most American cars can tow one of our campers. 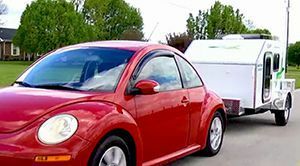 PeeWee teardrop campers are easy to tow and maneuver! Our 5x8 and smaller models can be moved by hand. Retired? Income tight? Take a closer look at our KnockAbout model. Same size as the Half-Pint but less expensive.